The miracle of the number three. If at all there is a number which is worth mentioning a million times, then it is number 3. Number 3 is the epitome of goodness. It symbolizes sacrifice, purest love and eternal giver to humanity. This is the most loved and respected number of all in numerology. This is the number which connects all other numbers in numerology. This is the number which is the most significant of all, without the quality of number 3, the world would have ceased long back, As it is the quality of love which holds our earth firmly in this very moment. From time to time in history of the world various numbers cheifly those from 1 to 12 have been regarded as possessing a mystical significance, but there can be no doubt that in the extent, variety and frequency of its use the number 3 surpasses all the rest. The Number 3 is considered to be feminine and introvert and relates to the planet Jupiter. The Tarot card representative of the 3 energy is The Empress. According to the pre-Christianity monotheist belief system of the Assyrians, in the Tree of Life, Trinity has been defined as Father (Ashur), Mother (Ištar), and the Son (Ninurta/Nabu) who is the King of Assyria. The mother, Ištar, is energy and love, and Ištar is female, exactly same concept of Holy Spirit. In the Bible, the Trinity consists of Father, Son, and Holy Spirit. There are three qualities of the universe: Time, Space, and Matter. To exist (except for God), all three are required. Each quality consists of three elements. Therefore, we live in a trinity of trinities. The symbol of three is the triangle. A triangle is the simplest planar figure and a cube is the simplest three-dimensional solid. So as two could represent a square, three could represent a cube or solid contents. Three therefore represents that which is solid, real, substantial, complete and entire. Three interwoven circles or triangles can represent the indissoluble unity of the three persons of the trinity. Others symbols using three are: trident, fleur-de-lis, trefoil, trisula, thunderbolt, and trigrams. 3 is the most magical number there is. Metaphorically speaking, of course. But why is that? Let’s start with the 3 dimensions: length, width, and depth (or height). 3 actual dimensions, that is, not the pretend stuff that Hollywood is currently making ill-gotten gains from. There are 3 parts to time, as we understand it: past, present and future. The number 3 is a very mystical and spiritual number featured in many folktales (three wishes, three guesses, three little pigs, three bears, three billy goats gruff). In ancient Babylon the three primary gods were Anu, Bel (Baal), and Ea, representing Heaven, Earth, and the Abyss. Similarly, there were three aspects to the Egyptian sun god: Khepri (rising), Re (midday), and Atum (setting). The number 3 can be used to measure anything and to control and predict anything. Goldilocks rated porridge using the magic number; too cold, too hot and just right. She rated beds the same way; too hard, too soft and just right. Good sales people always give you 3 options and then recommend one, e.g., too complicated for your needs, too simplistic for your needs, just right, the one I recommend. People are either too fat, to thin or just right. A meal is too big, too small or just right and so on and so on ad nauseam. We live on the 3rd planet from the sun. There are 3 prime colours. 3 is a prime number. There are the “3 kingdoms”: Animal, mineral and vegetable. There are 3 phases to the moon. Lunar animals are often depicted as 3 legged. One symbolizes unity, agreement, simplicity. When something exists alone, nothing disturbs it. It remains completely at peace, without regard for anything else. Two symbolizes duality, tension and complexity. The number three symbolizes a harmony that includes and synthesizes two opposites. The unity symbolized by the number three isn’t accomplished by getting rid of number two, the entity that caused the discord, and reverting to the unity symbolized by number one. Rather, three merges the two to create a new entity, one that harmoniously includes both opposites. On its own, Entity A leaves no room for Entity B, and Entity B does not allow for the existence of Entity A. Entity C demonstrates how A and B really are compatible, and even complementary. Bringing together two opposites (A and B) requires the introduction of an entity or common goal (C) that is greater than both of them. As humans, we are made up of three main parts: the mind, the body and the soul. And of course, if you’re a parent wrestling three car seats into a car, this may sound a bit absurd. But, in the chaos of many children, the tendency is to look back on the first and think: “Really? I thought that was hard?” But this mind-set ignores the present bias — believing that how you think now is how you’ve always thought. If you’re full, it’s hard to imagine being hungry. Likewise, by the time the third child arrives, it’s hard to remember what a seismic shift becoming a parent really was. We do things in threes so they will manifest in our physical realm. The word three itself shows a threefold us: one definite its actual intrinsic value; another, symbolic, mystic, esoteric; the third, indefinite, of an indeterminate number of times, even in the sense of “many”. The study of the symbolic 3 takes us back to a remote antiquity, into the realms of mythology, religion, mathematics, philosophy, and magic – in fact, into almost every province of knowledge, to many and diverse lands, to peoples civilized and uncivilized, and to nations both ancient and modern. For the Egyptians, 3 is the number of the cosmos that comprises three elements: sky, earth and “duat” (zone surrounding the intermediate worlds between the earth and celestial spirits). This was considered the perfect number according to the Chinese. In the Bible there are many uses of the number three. To be exact the number three is used 523 times in the Bible. Also the Buddhist monk’s prayer beads (mala) are an exact amount of beads that is divisible by the number three. The Pythagoreans considered three the first true number. The basic symbol for plurality among the ancient Egyptians was the number three: even the way they wrote the word for “plurality” in hieroglyphics consisted of three vertical marks ( | | | ). Triads of deities were also used in Egyptian religion to signify a complete system. Examples include references to the god Atum “when he was one and became three” when he gave birth to Shu and Tefnut, and the triad of Horus, Osiris, and Isis. God is like a three-part leaf, like the three states of water, like the three branches of the U.S. government. They leave one, at the very least, feeling that this God is rather bizarre. The word LOVE itself comes 21 (3). The Rule of Three (also Three-fold Law or Law of Return) is a religious tenet held by some Wiccans/Pagans. It states that whatever energy a person puts out into the world, be it positive or negative, will be returned to that person three times. Some subscribe to a variant of this law in which return is not necessarily threefold. The Rule of Three is sometimes described as karma by Wiccans, however this is not strictly accurate. Both concepts describe the process of cause and effect and often encourage the individual to act in a good way. However the concept of karma, according to the scriptures of Buddhism, Hinduism and other eastern belief systems, does not operate on a system of three-fold return. The Rule of Three has been compared by Karl Lembke to other ethics of reciprocity, such as the concept of karma in Dharmic religions and the “Golden Rule“. The Rule of Three has a possible prototype in a piece of Wiccan liturgy which first appeared in print in Gerald Gardner‘s 1949 novel High Magic’s Aid. For a law to truly be a law, it must be universal — which means it needs to apply to everyone, all the time, in every situation. That means for the Threefold Law to really be a law, every single person who does bad things would always be punished, and all the good people in the world would have nothing but success and happiness — and that doesn’t just mean in magical terms, but in all non-magical ones as well. We all can see that this is not necessarily the case. In fact, under this logic, every jerk who cuts you off in traffic would have nasty car-related retribution coming his way three times a day, but that just doesn’t happen. The rule of thirds is a “rule of thumb” or guideline which applies to the process of composing visual images such as designs, films, paintings, and photographs. The guideline proposes that an image should be imagined as divided into nine equal parts by two equally-spaced horizontal lines and two equally-spaced vertical lines, and that important compositional elements should be placed along these lines or their intersections. Proponents of the technique claim that aligning a subject with these points creates more tension, energy and interest in the composition than simply centering the subject would. Third time also seems to be the charm when it comes to raising Mom’s stress levels. According to a recent survey of American mothers, three is the most stressful number of children for a woman to have. The TODAYMoms.com survey found that mothers of three report experiencing more stress than moms of one or two children. Perhaps that isn’t surprising, but stress levels also seemed to drop off as number of children increased, with mothers of four or more children reporting lower stress levels than those moms of three. 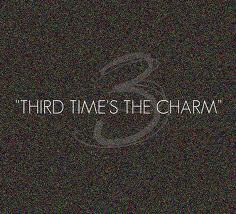 The Number 3 symbolizes the principles of growth. When the initiating force of 1 unites with the germinating energy of 2, there is fruitfulness = 3, the Trinity. 3 signifies that there is a synthesis present – that imagination and an outpouring of energy is in action. The ‘thought’ of 1 and the ‘fertility’ of 2 results in the ‘creativity’ of 3. The joy and happiness of the 3 vibration is to be shared with others. The power of three is universal and is the tripartide nature of the world as heaven, earth, and waters. It is human as body, soul and spirit. Notice the distinction that soul and spirit are not the same. Three is birth, life, death. It is the beginning, middle and end. Three is a complete cycle unto itself. It is past, present, future. The first three days of creation serve as an example for these three stages. On the first day, life had not yet been created. Who would have thought that the number three could wield such power? It’s such a simple, unimposing numerical value; almost cute in appearance. Yet as it turns out, this small digit is value-packed. This entry was posted in Uncategorized and tagged ancient egypt, Babylon, Britney Spears, consciousness, education, egypt, god, HolySpirit, humanity, Jupiter, Khepri, life, love, nature, Number 3, Numerology, Rule of 3, Tarot, The Number 3, Third Times The Charm, Trinity, Zodiac. Bookmark the permalink.